Las Vegas, Nevada – October 30, 2007 – Truck Covers USA presents its new, innovative truck bed and tool box lighting systems called American Cargo Lights. 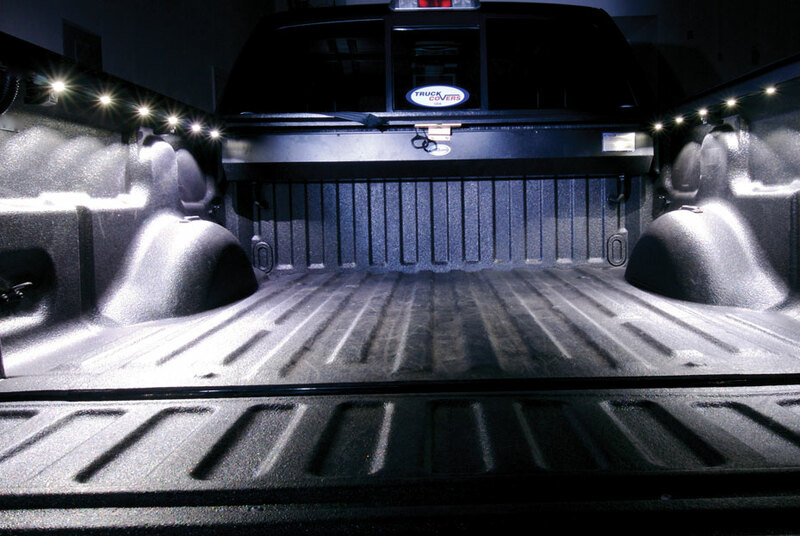 Built using 3M’s new Light-by-Wire technology, the American Cargo Lights bring a high-end, custom feel to truck bed and tool box interiors while providing task lighting for these hard-to-light spaces. 3M’s Light-by-Wire technology has built-in reverse polarity protection, built-in lens and over-molds that fully protect all the LEDs. Truck Covers USA has put that technology to work for its American Cargo Lights, which provide a flush, trim-looking product that is less likely to be bumped and damaged due to its flat profile. Truck Covers USA’s American Cargo Lights are available in separate three- and four-foot lengths, or in specially designed packages for full cargo lighting capabilities for truck beds and beyond. The basic package includes a convenient built-in on/off switch and two-way 3M jumper and power connectors. The American Cargo Lights can either be powered with a battery pack or hardwired into the truck’s electrical system. Truck Covers USA is located in San Diego, California, and has been in business since 2000. The company is well known for its premium roll-top truck bed covers, as well as its high-quality, top-of-the-line cargo management system, hitch plug step, tailgate support beam and automotive cleaning cloths. Every day, 3M people find new ways to make amazing things happen. Wherever they are, whatever they do, the company’s customers know they can rely on 3M to help make their lives better. 3M’s brands include Scotch, Post-it, Scotchgard, Thinsulate, Scotch-Brite, Filtrete, Command and Vikuiti. Serving customers around the world, the people of 3M use their expertise, technologies and global strength to lead in major markets including consumer and office; display and graphics; electronics and telecommunications; safety, security and protection services; health care; industrial and transportation. For more information, including the latest product and technology news, visit www.3M.com. OSRAM is a trademark of OSRAM GmbH.